With a series of books already published, I looked for a new project. I wanted to take a different approach with different characters. 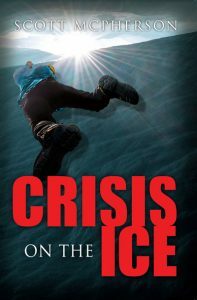 Crisis On The Ice has a mystery in it but it is very much an action-adventure novel. It is set in Antarctica, a continent that I visited while serving in the US Air Force. My experience there combined with imagination brought about the genesis for Crisis On The Ice. Antarctica is a desolate but mysterious place. It holds a beauty that cannot be found anywhere else on earth as well as hidden dangers and a harsh climate. What an ideal location for a novel. The drama and conflict are drawn from international tensions and a human tendency to always want more. In my Jack Sharp Novel series, my main character tends to be much like me. I wanted a different lead character, someone who was young, vibrant, inquisitive. Yet Gabe Hunter is still a “good” guy and he even knows Jack Sharp. He’s from Nebraska, a place I know well, working on a project associated with at real research program from the University of Nebraska. His team is made up of younger graduate students, one from Nebraska, Molly Nelson. She is pretty, intelligent and just close enough in age to provide a potential for romantic tension. Seth Fletcher is a tough, fiery Scotsman from Glasgow. He is a late add-on to the project as Gabe wanted three students. He isn’t easily managed and can be defiant toward Gabe. Min Zhu, from China, fits in well. She is quiet but is also a peacemaker. She doesn’t get drawn into the drama easily. Likewise, since one of the antagonists is from her home country, there is possible stress there as well. Marcus Reeder constitutes the worst kind of “bad” guy. He is smooth and pleasant when he wants to be but utterly ruthless. Chen Han does not fit well in the role but is forced to play the antagonist when circumstances push him to the limit. Other characters are similar to people I may have known in my work or military career.